A view of the Neutron star Interior Composition Explorer (NICER) X-ray Timing Instrument without its protective blanketing shows a collection of 56 close-packed sunshades—the white and black cylinders in the foreground—that protect the X-ray optics, as well as some of the 56 X-ray detector enclosures, on the gold-colored plate, onto which X-rays from the sky are focused. NICER, an upcoming NASA astrophysics mission, will uncover the physics governing the ultra-dense interiors of neutron stars. Using the same platform, the mission will demonstrate trailblazing space navigation technology. The NICER mission arrived at NASA’s Kennedy Space Center in Cape Canaveral, Florida, on June 8, 2016. Currently scheduled for launch to the International Space Station in February 2017 aboard a SpaceX Dragon cargo spacecraft, NICER will deploy as an external attached payload on the ISS ExPRESS Logistics Carrier 2. 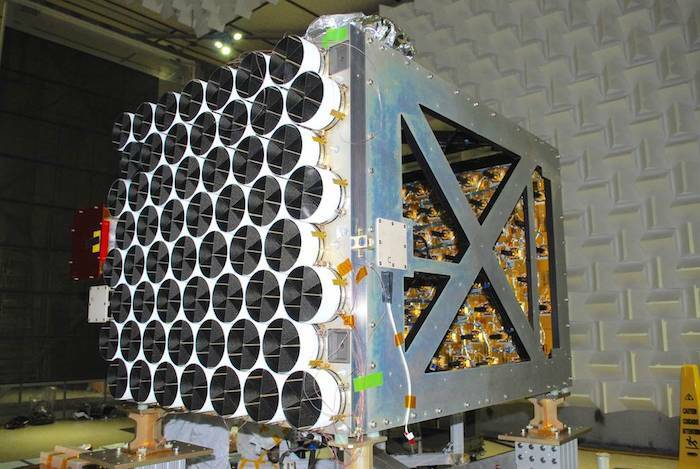 Its 56 X-ray optics and silicon detectors will observe and gather data about the interior composition of neutron stars and their pulsating cohort, pulsars. An upcoming NASA astrophysics mission will uncover the physics governing the ultra-dense interiors of neutron stars. Using the same platform, the mission will demonstrate trailblazing space navigation technology. The multipurpose Neutron star Interior Composition Explorer (NICER) mission arrived at NASA’s Kennedy Space Center in Cape Canaveral, Florida, on Wednesday, June 8. The forthcoming International Space Station (ISS) payload was transported from NASA’s Goddard Space Flight Center in Greenbelt, Maryland, aboard a climate-controlled, air-suspension truck. NICER Mechanical Engineer Steven Kenyon (left) and GPS and Star Tracker Camera Engineer Eric Rogstad (right) prepare NICER for shipment to Kennedy Space Center in Florida. The payload will be deployed on the International Space Station (ISS) in early 2017. A neutron star begins its life as a star approximately 10 times the mass of the sun. When its nuclear fuel is exhausted, the star’s outer layers explode in a supernova. Crushed by its own gravity, the star’s core collapses and forms a neutron star. These collapsed stellar corpses are the densest, most strongly magnetic and most rapidly spinning objects known in the universe. Neutron stars, which squeeze up to twice the sun’s mass into a city-size volume, are powerfully bound by gravity that is exceeded only around black holes. Theory has advanced a host of models to describe the physics of neutron star interiors, including the very nature of high-density matter that cannot be produced in any laboratory on Earth. NICER’s astrophysical observations will test these models. Some rapidly rotating neutron stars, called pulsars, are cosmic lighthouses that sweep narrow beams of radiation through space as they spin. Pulsars can spin up to hundreds of times every second, producing flashes of light from radio through gamma rays detected at Earth with clock-like regularity. NICER will exploit these pulsations to perform cutting-edge astrophysics investigations while another aspect of the mission – the Station Explorer for X-ray Timing and Navigation Technology (SEXTANT) project – demonstrates a technological first: real-time, autonomous spacecraft navigation using pulsars as beacons, ultimately furthering deep space exploration into the solar system and beyond. Keith Gendreau and Zaven Arzoumanian are the mission’s principal and deputy principal investigators, respectively. 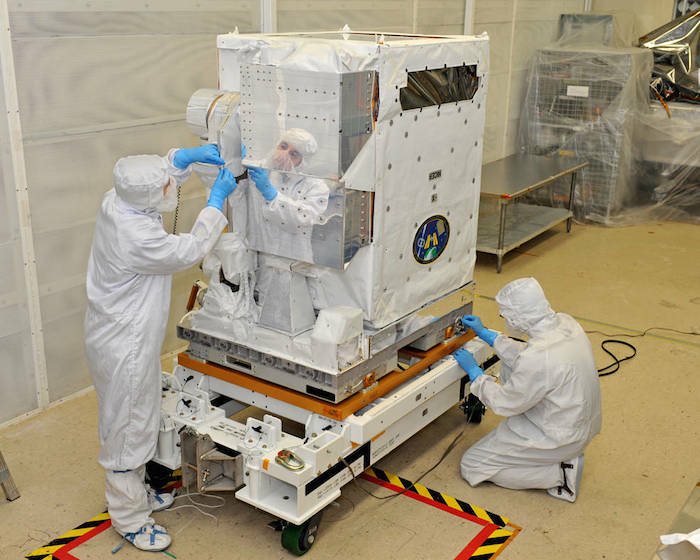 NASA Goddard provides overall mission design, development, management, science leadership, system engineering as well as payload integration, testing and flight operations. Partners from industry and academia include Moog Inc., the Technical University of Denmark and the Massachusetts Institute of Technology.